and community-level metrics. We’re continuing this effort to manage Google+ communities by introducing Google+ community metrics, surfaced in two places: the Admin console and in the Google+ community dashboard. First, community owners and moderators can now see new membership and engagement statistics about their community using the new "Insights" tab. If they’d like more information on a particular metric, mousing over it will provide additional context to help with interpreting the data. To access these insights, an owner or moderator can click on the “Manage” button (previously the “Moderate” button) and select the “Insights” tab. Please note, this dashboard will only be available to owners and moderators of Google+ communities. For more information on moderating a Google+ community, please visit the Help Center. For G Suite administrators, we've also added the ability to see all communities owned by members of your organization, sortable by metrics such as total members, active members, number of posts recently made, and more. In this report, which can be found in the Admin console by going to Reports > Apps > Google+ > Communities report, you’ll also be able to see the community’s “Visibility,” indicating whether or not it’s restricted to your domain. You can choose to view either the last seven or 30 days worth of data. As with our previous reporting additions, these metrics are available in both the Admin console and Reports API. Earlier this year, we announced additions to Google+ metrics to better understand user activity and community-level metrics. 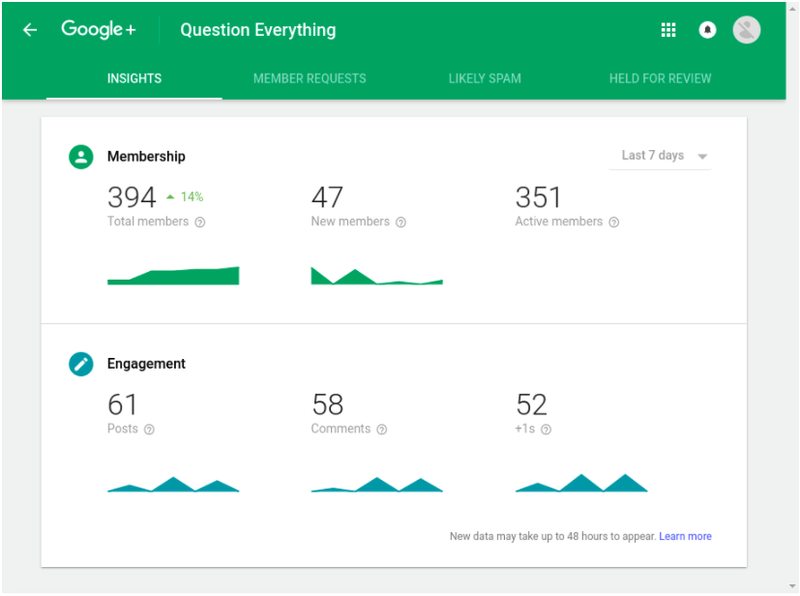 We’re continuing this effort to manage Google+ communities by introducing Google+ community metrics, surfaced in two places: the Admin console and in the Google+ community dashboard.